An English country-house murder gets a Hollywood twist. Donald Langham, a mystery novelist with a sideline in detective work (Murder at the Loch, 2016, etc. ), is about to marry beautiful, talented Maria Dupré, who’s just been offered a promotion at the literary agency of Charles Elder, when he’s approached by rising Hollywood star Suzie Reynard, who worries about the safety of her lover, Douglas Dennison, the director of the movie currently in production at Marling Hall. Dennison, who served with Edward Marling in World War II, is doing him a financial favor by renting the place for his film. Posing as friends of Suzie's, Donald and Maria go to Marling, where they discover that the arrogant, womanizing Dennison is far from universally popular. So everyone is shocked when it’s Suzie who’s found shot dead in Dennison’s caravan. It turns out that Dennison had an affair with Edward’s future wife, Cynthia, before the war and left her pregnant. He also had an affair with Varla Cartier, another cast member, who seems to have no love for Suzie. The male lead, handsome young newcomer Chuck Banning, acts unusually interested in Cynthia. Langham, suspecting that Suzie was shot because she saw the killer, continues to ponder the lengthening list of Dennison's enemies. The movie’s screenplay is based on an old crime that took place nearby. 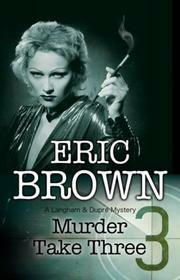 Even after Langham solves that case, he seems no closer to solving Suzie’s death until further murders suggest that the sins of the past may hold the answer. Cozy fans will enjoy the charming, curmudgeonly characters but have no trouble spotting the killer.